I like to try new varieties and compare them to old favorites. A number of bloggers have mentioned Sugarsnax carrots so I tried them this year even though I remembered reading that Sugarsnax do not do well in the Northeast. Now I know what that statement means. I grow carrots in my plot at the Vassar Farm community gardens. Although conditions are far from ideal, with the right varieties I can grow a good carrot. The soil is very slippery when wet, probably a clay and silt mix. Although heavy, the soil is good for carrots because it holds the moisture and it is nearly rock free. I feed the soil by mulching heavily with leaves every year. I loosen the soil deeply with a garden fork before planting and never walk on the beds so the soil stays loose. The pH is around 7.0. The garden gets full sun – from sunrise to sunset. My carrot planting on June 30. This garden area has been under continuous cultivation since the Civil War so it has every disease and pest that can survive in Poughkeepsie, NY, including carrot foliage diseases. 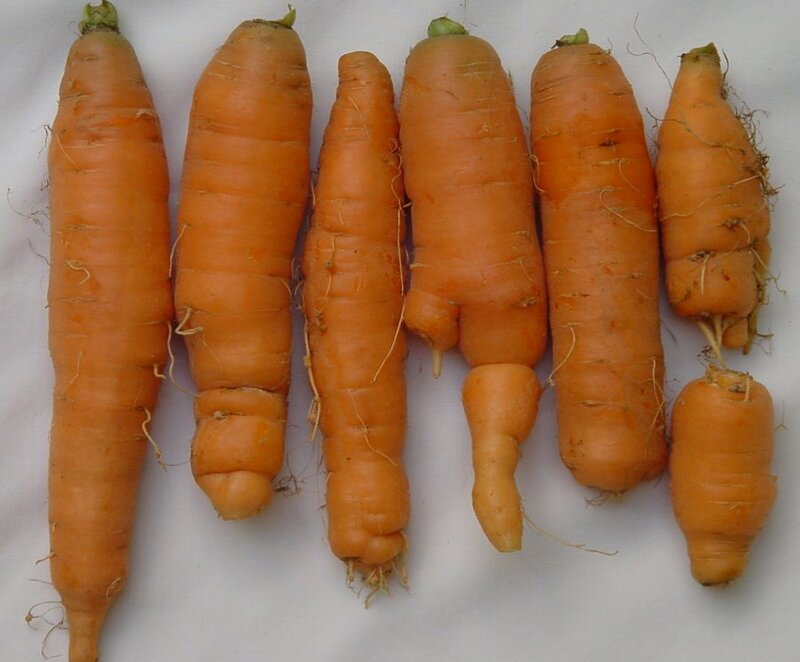 I’ve found the carrot varieties that grow best are resistant to Alternaria and Cercospora. Seed catalogs describe Sugarsnax carrots in glowing terms: tender and sweet with smooth, uniform, 9″ tapered roots and strong tops resistant to Alternaria, Cercospora, and Pythium diseases. Maturity is 68 days. I planted Sugarsnax 4/30/2013. Based on my experience with varieties such as Yaya and Bolero, I expected to eat good-sized thinnings in early July and full-sized carrots in mid-July. That is not what happened. 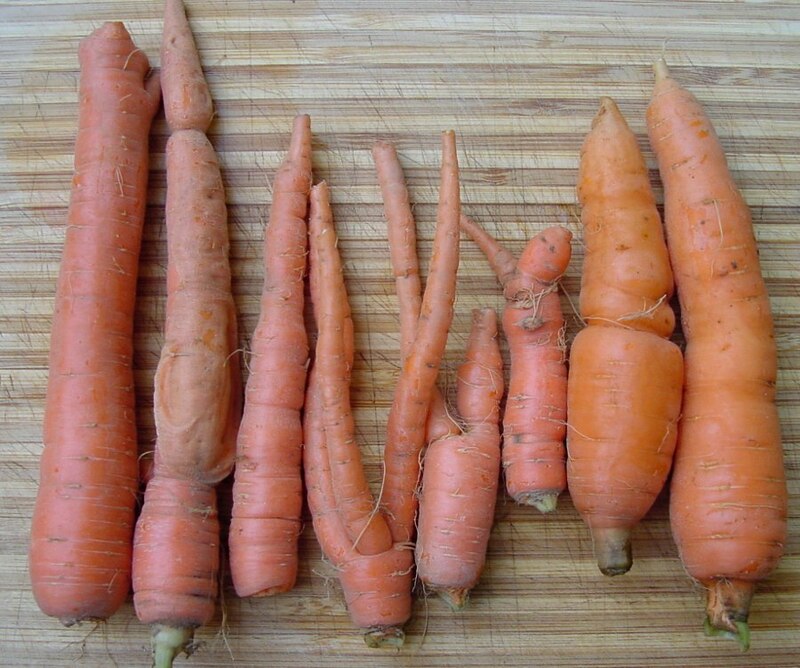 Three months after planting most Sugarsnax carrots were still less than an ounce. Very disappointing. 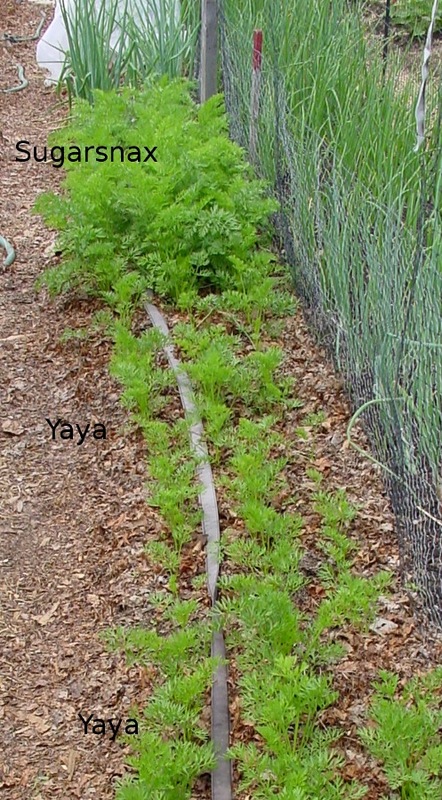 In contrast, I planted Yaya May 20, three weeks after Sugarsnax, and in late July harvested carrot carrots around 1.5 ounces. They will continue to grow and get heavier. In color, Yaya is a lighter orange than Sugarsnax. Sugarsnax falls short in several other ways. My Sugarsnax carrots are tough, even (or perhaps especially) the pencil thin carrots I pulled in early July before the hot weather. My molars were in bad shape (two missing on one side and a temporary crown on the other side) and eating a Sugarsnax caused a great deal of pain as it jammed between the temporary crown and adjacent teeth. Yaya carrots are tender enough to eat without getting stuck. 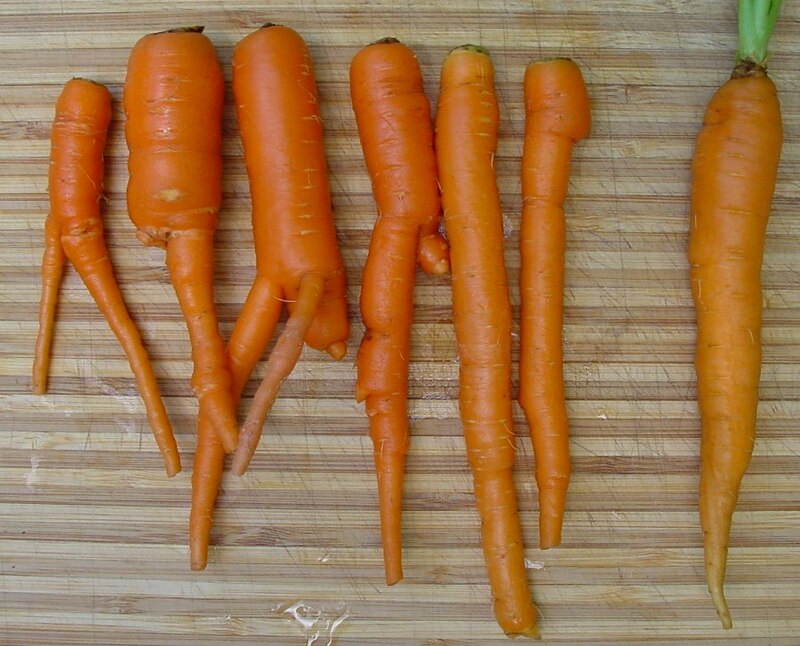 My Sugarsnax carrots have a strong sharp carroty flavor with no sweetness. Yaya lacks the sharpness and is a lot sweeter. My Sugarsnax roots are not smooth, instead they are ‘hairy’ with lots of rootlets. I’ve pulled a few 9″ roots, but most roots have a kink and a fork at 4-5″. Yaya roots are smoother and plumper and don’t fork. As they age (of course, I’ve left them in the ground too long, hoping they will get bigger) some Sugarsnax are starting to ‘unwrap’, with the outer layer splitting the long way and separating from the core. On the positive side Sugarsnax tops are very strong and healthy with no signs of disease. The seed also germinated quite well. This does not make up for the poor eating experience. Aug 28: top left, 3 Sugarsnax, R – 2 Yaya, bottom left – Bolero thinnings. That 11″ Sugarsnax is the biggest and best looking of the harvest. I shared it with my husband. It was a bit more tender than the earlier carrots but the flavor was harsh and unpleasant. But note: the other two Sugarsnax from the same planting are still tiny after 4 months. The Yaya carrots from the May 20 planting are starting to get oversized but are still tender and sweet. The Bolero thinnings are from plantings made July 1-5 and are the size I expect for a ‘good-sized thinning’. I’ve found the best use for these Sugarsnax carrots is in cooking: as a natural rack under a roast, or as the carrot you add and later throw away when making broth. With the Sugarsnax being so small they are getting used quickly because it takes several carrots to do anything and I’ll be happy when they are gone. Good riddance! BTW the temporary crown has been replaced by a much better fitting permanent crow so I can now chew any carrot – even Sugarsnax. I will definitely stay away from sugarsnax. Great detailed info and comparisons, thanks. I certainly mention SugarSnax because they do well in my New England garden. But I have sandy soil. I do find that Mokums are more tender and sometimes but not always sweeter (the other carrot variety I grow). Spring planted SugarSnax I’ve found really only good for cooking, though it only requires a light cooking to get rid of the bitter taste. Mokums are sometimes also bitter and sometimes not. However in the fall both are very sweet and not bitter. At least for me. I’ve never gotten carrot diseases though. I do have pests. Nematodes can be an issue sometimes. Though now that I don’t grow tomatoes anymore I find it less of an issue. The carrot fly can make of mess of any carrot after the beginning of July. I like both carrots for different reasons. Mokums are earlier and better for fresh eating, which is nice. SugarSnax can really pump out the poundage for fall storage, but (for me at least) is still sweet and delicious to eat fresh in the fall. I always find it so interesting when one thing will grow well in one spot but another garden can be totally the opposite. When I moved from a spot just 15 minutes from where I live now, I had to relearn when and what to plant. Bolero works so well for fall harvest and storage in my root cellar that I’m not willing to give Sugarsnax a second try. If I remember correctly when you harvested all your spring Sugarsnax earlier this year most of them were small. Have you ever tried Yaya? it might be more consistent than Mokum in terms of flavor. I vowed to quit trying to grow spring carrots. Fall carrots grow really well in my garden and are always sweet after a frost or two. Spring carrots are always a struggle from germination to pitiful harvest. But you have mentioned Yaya several times now and I am wondering if I should give it a try. I see Fedco has it. Hmmm…. Don’t give up on spring carrots. The right variety can make all the difference. Impressive you can grow watermelons in Poughkeepsie. Thanks for the carrot comparison. I already had Yaya on the “maybe” list for next year. My spring-planted carrots took a month to germinate so they were quickly shaded out by other plants in the beds. I never got around to doing a fall planting. Comparing Sugarsnax to a Mokum, Bolero or yaya is like comparing a granny smith to a Fuji. Both are apples but very different. Sugarsnax is an Imperator carrot (California type or western shipper) mostly used to make baby carrots from. Bolero and Yaya are Nantes types and are most always going to be more tender which in most minds equates with sweetness. During certain times of the year, summer mostly, the terpiness or carrot flavor derived from terpenoids can make the carrot bitter or strong. Most of those oils reside in the skin which is why or mom’s peeled them. If I were going to plant a carrot in a garden I would choose a nantes type. Commercial growers on a large scale do not produce nantes because they are too tender to harvest with machinery. Imperators such as Sugarsnax are more durable hence the molar issue mentioned above. Still Sugarsnax is consistently more tender than many other Imperator types. Have fun. 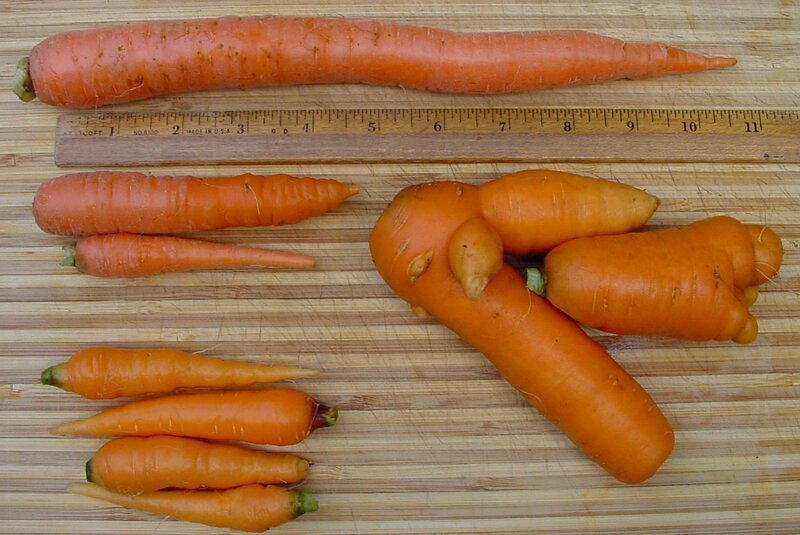 Baby carrots – what a waste, to process an imperator down to a 3″ nubbin. Sugarsnax seed is available to the home gardener but is a poor choice for the northeast.